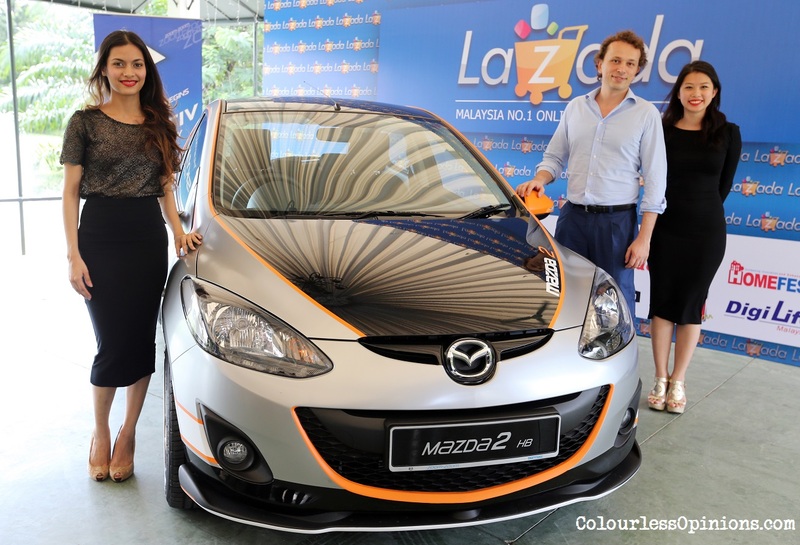 Lazada Malaysia celebrate their first anniversary by having a contest with prizes worth of RM120,000 in total, including the sporty Mazda 2 hatchback shown in the image above. Do you care who the people in the photo are? In case you do, the dude’s Igor Pezzili, the CEO, and the two ladies are ambassadors with no names provided. The contest’s called Giveaway Extravaganza (how original) and is running until 20th of June 2013. To “thank” and “reward” their customers in appreciation for the success of their first year, their plan is to have them to spend more apparently. But wait, why was I at this press conference? ‘Cause on the email I received from them, it says that there’ll be a lucky draw at the event. It also told me to bring my business card for it. But in the end at the event, it wasn’t even mentioned at all. Oh well, at least everyone was given a RM100 voucher which I could probably use it to buy a decent cheap watch. chance to win other prizes when used during the contest period. be available on 1st June 2013). Whew! A car is still a car… How about a house and lot next time? Or a condo unit perhaps? Lazada is not an ethical company, The Specifications for the products they adverstise is not what it is upon reciept. No point complaining, they request you ship back to them via Pos Laju and a respond will be available within 7-10 day. Now how is one going to work without a smart phone for that period of time. Worst When I voluntereed to personally ship to them at their site office it was not entertained. Similairly the statement that you can have a refund is also a scam. The procedure is so exhaustive that one runs out of energy to claim. Sure way to get 100 million with massive internet cheating. Currently there is no law to get these bastads to be responsible to buyers. One other Lelong gets away with the same thing by having the companys' address in Sarawak. Just try to make a claim you look like an Idiot.